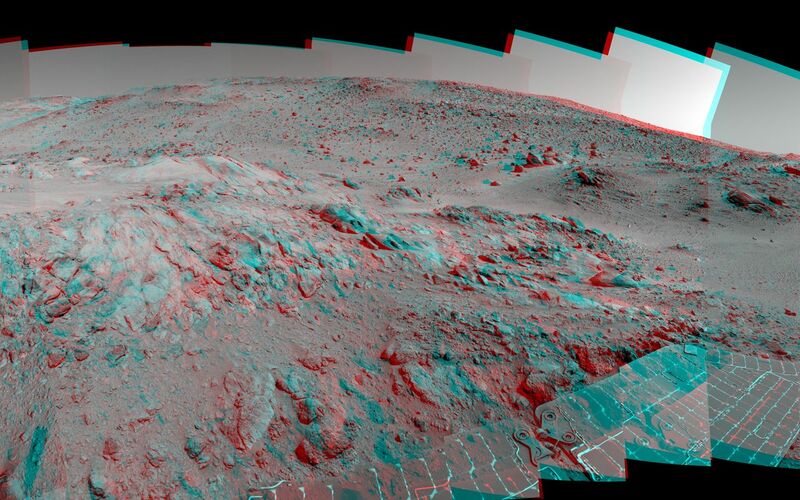 This is a stereoscopic version of the Spirit panoramic camera's "Lookout" panorama, acquired on the rover's 410th to 413th martian days, or sols (Feb. 27 to Mar. 2, 2005). The view is from a position known informally as "Larry's Lookout" along the drive up "Husband Hill." The summit of Husband Hill is the far peak near the center of this panorama and is about 200 meters (656 feet) away from the rover and about 45 meters (148 feet) higher in elevation. The bright rocky outcrop near the center of the panorama is part of the "Cumberland Ridge," and beyond that and to the left is the "Tennessee Valley." 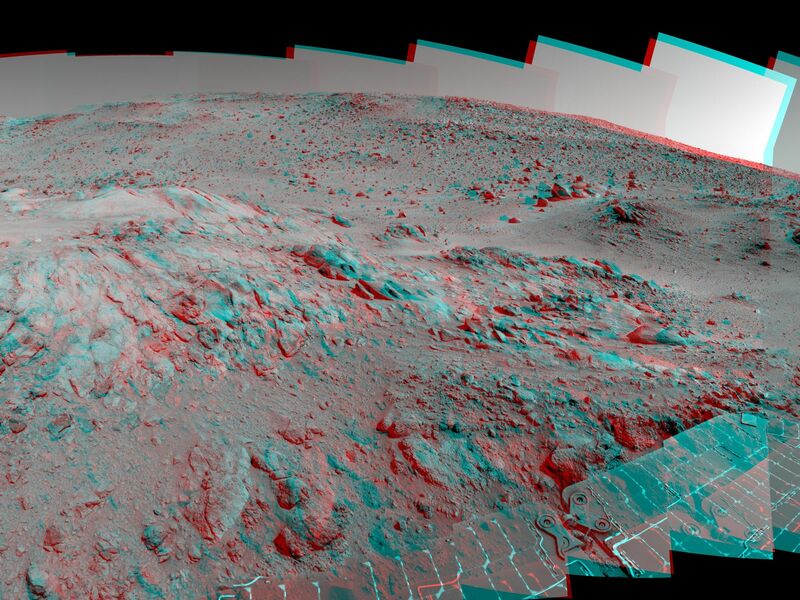 Spirit's tracks leading back from the "West Spur" region can be seen on the right side of the panorama. The region just beyond the area where the tracks made their last zig-zag is the area known as "Paso Robles," where Spirit discovered rock and soil deposits with very high sulfur abundances. 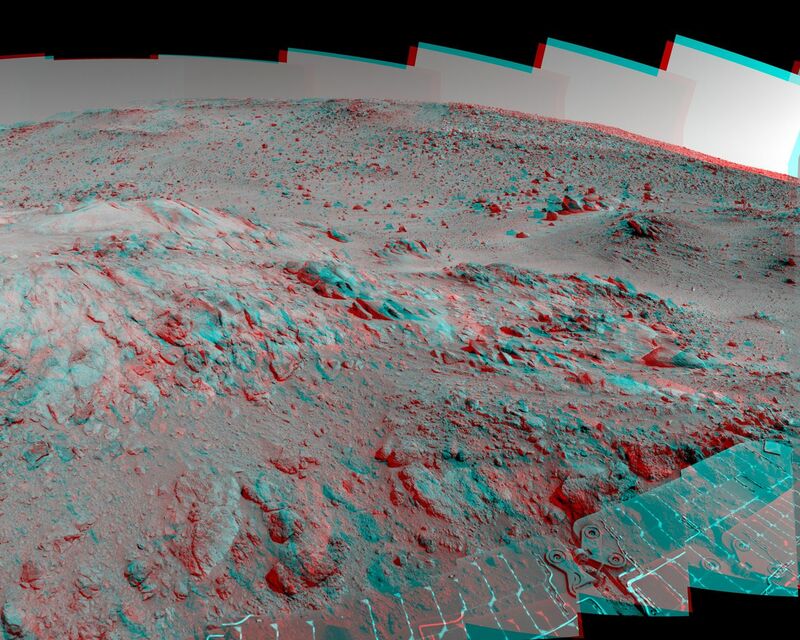 This stereo anaglyph is presented in a cylindrical-perspective projection with special "untilt" processing. The tilt of the rover (roll -14 degrees, pitch +13 degrees) has been removed by special processing of the images, resulting in a flat horizon (thus a more "natural" view) with very little vertical disparity. (Vertical disparity is one of the main things that give you a headache when looking at stereo images.) Geometric and brightness corrections have been applied.